Rail passengers are advised to expect "significant delays"
Send a text to +44 7624 800 100. This concludes our live coverage of the disruption to Channel Tunnel services today. Services remain suspended after smoke was detected by two CO2 detectors in the south tunnel at around 11:25 GMT. A load on a lorry on board a train, en route from the UK to France, had been "smouldering", a Eurotunnel source said. No-one was hurt in the fire. 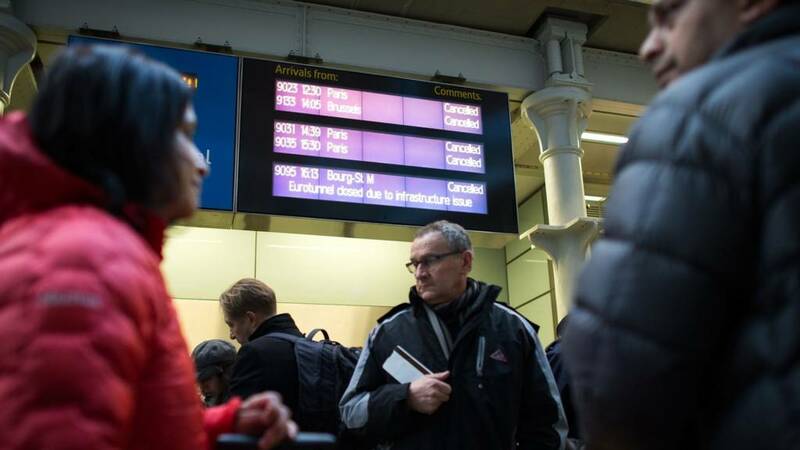 Eurostar, which operates passenger trains, has cancelled all its services for Saturday, while Eurotunnel says it expects to resume vehicle and freight services on Saturday night. tweeted: "Confirmation is currently awaited as to tunnel re-opening tomorrow together with any specifically Eurostar service resumption." Tim Hatton from Guildford emails: We've been in Paris for a friend's birthday lunch - we think we must have got one of the last trains through this morning and are now at the airport on the way home. Most expensive lunch ever! tweets: We're handing over now to our on call team who will continue to help and answer your tweets tonight - have a good evening wherever you are. Sarah Lee in Belgium emails: We were stuck for three hours on a train at the entrance to the tunnel on the French side. They announced after 20 minutes that the tunnel was closed and took another 2h40 to get us off. Sent us to the ferry where it was total chaos. We were rammed by a white van which was trying to get ahead in the queue and were given no information on the departures or available places. Now in queue for the 18:15 ferry which clearly won't be leaving on time as it's just unloading! Nightmare journey! tweets: Walked past unbelievable queues for the Eurostar on my way to Lyon today and the tunnel is still closed. Unlucky ladies and gents. Anna Brown emails: I am British and live in Belgium, was meant to be travelling back home to Brussels today, from Folkestone on the Eurotunnel. Luckily the closure news broke just before I left, so I rushed to make a ferry booking with P&O for the 1745 crossing. This has now been delayed by an hour, maybe longer. I'm sitting here dockside, Dover is packed, all lanes full with waiting trucks and car passengers, everyone hoping to get across. It's pretty chaotic, plus the heightened security hasn't helped. Hope I get across the channel tonight! Services on the car shuttle service are expected to restart as soon as possible after French firefighters have given the all-clear, a Eurotunnel spokesman said. He told the Press Association news agency the south tunnel would reopen - following the fire in the north tunnel - and Eurotunnel anticipates running a full service on Sunday. statement from Eurostar said it was still "unable to run trains today" because of the closure. "If you were planning to travel today, we advise you to postpone your journey. Please do not come to the station." Jonathan Martin emails: After 15 days of inter-railing to Istanbul and back we were due to get the 17:13 back to St Pancras. Eurostar have offered to compensate up to £150 for a hotel room as well as extra for travel and food expenses. This is pretty sweet after staying in hostels the last couple of weeks and being on the train for pretty much 26 hours straight from Belgrade in the last couple of days. Eamonn Thorpe emails: Wife and daughter trapped in France. Not much money for alternative arrangements and can't get through to Eurostar! Also no update on website as to what passengers should do!! Seems to be a total lack of urgency from Eurostar. Penny Whitney emails: I and my two travelling companions were booked on the 14:13 Paris to London Eurostar today. We were already in the departure lounge when the announcement came that the trains were being cancelled. We have been told to go back to the station before 8 am tomorrow, as our tickets will be valid on any train. However, I guess several hundred people will be doing the same thing! There doesn't seem to be any process or procedure for rebooking onto a specific train tomorrow. I guess it will be 'first come, first served'! Fortunately we were able to book into the Gare du Nord station, and we will be recompensed for our additional, unexpected, expenditure. Not exactly delighted. Eurotunnel expects to resume Le Shuttle services through the Channel Tunnel this evening following a lorry fire, it has said. Tom Cosgrove emails: Currently we are in Paris with a large group of students from our school, ACS Cobham International School. We came here Friday morning to play rugby and basketball against the British School of Paris and the American School of Paris. Since hearing about this incident we have started to frantically arrange plans to make it home tonight. We originally travelled in by Eurostar and were planning on taking it home this evening. Our 80+ students are occupying themselves for the time being but we are unsure if we can arrange for a coach to Calais and walk onto the ferry. We are also hoping a British coach will be able to pick us up from Dover. Nigel Harris, managing editor of Rail Magazine, said as many as 20,000 passengers could have been disrupted by the fire. "If you have 26 trains cancelled or reversed with a capacity of 780 people per train that is over 20,000 people immediately affected by the train that we know about." The AFP news agency has reported that the fire in the Channel Tunnel is "in the process of being brought under control". Pete Richardson emails: We are booked on the Euro Tunnel Shuttle to come back to the UK from France tomorrow morning. We now have absolutely no idea if the service will be running at all and no useful information from the Euro Tunnel about what to do, apart from having their sincere apologies and a 24 hour recorded phone service number. All we need now is for the auto route to be closed because of the stacking of delayed freight lorries! Looks like a long weekend away is rapidly turning into a week of chaos to come; not for the first time either. Doreen Hall emails: My granddaughter and her friend are stranded in Paris. They went to catch the Eurostar but were told to come back at 6 o'clock, no mention of a definite hotel for the night, the staff at Eurostar told them if possible they would provide hotel accommodation. There are a significant number of people stranded in France - no-one is helping them and in the current situation in Paris where is the British Embassy, why are they not helping UK citizens? Other trains were then cleared from the tunnel and emergency services found the cause of the smoke was a load on a single lorry, which was smouldering. The lorry was treated by fire fighters and Eurotunnel said the area is now being ventilated. More details are now coming through about the fire earlier. The BBC's Mark Smith, who has spoken to Eurotunnel, said two carbon dioxide detectors showed the presence of smoke in the north tunnel at 11:25 GMT. The smoke was coming from a truck shuttle travelling from the UK to France and passengers and crew were then evacuated into the service tunnel. Charlotte Longstaff, 17, and her boyfriend, travelled from Leicester to make a trip to Paris to celebrate their first anniversary, setting off at 07:45 GMT. "We're now staying the night in a hotel in Victoria which is costing £90 per night. "Our anniversary celebration was meant to be on Monday. I am disappointed but we will try to get to Paris for Valentine's Day instead." Officials have been giving out leaflets to passengers caught up in the problems, at St Pancras International. Mr Sheppard, from Bethnal Green in London, said: "There are loads of people just trying to figure out what they should do. We came down to the Ibis hotel and since we did about 10 other people have turned up trying to get a room for the night." Matt Sheppard, 26, who is stuck in Paris trying to get back to London, has told the Press Association that he was told trains might not be running from Gare du Nord station in Paris "until Monday". Eurostar has not said when services will resume. Joe Spence in Canterbury emails: My girlfriend found herself stranded in Brussels, so has jumped on a train to Calais to catch the ferry to Dover instead. Tell her I'll sort dinner out for when she gets here... and to pick up some wine whilst she's in France please. Kate Hodge, who is aiming for Shrewsbury, emails: Queuing as I speak at Calais, hoping to get the 18.15 ferry to complete a cross-channel journey that started in the French alps at 4.30 this morning. It's mayhem here at the ferry terminal - but due to the number of people, rather than lack of communication. All staff at both the shuttle terminal and ferry port have been both helpful and cheerful. Can't say the same for all the passengers!! Jerry and Clare Wood email: We were on the first train that stopped our (UK) side of the tunnel. After an hour we were told about the smoke and the train went back to London. We were due to join 12 friends in Paris for a 50th party, looks like they will struggle to get back tomorrow with their hangovers. Although we are very disappointed not to be there, the world has bigger problems right now, so we will stiffen our upper lips! The tunnel closure has also caused disruption at Gare du Nord in Paris, where news of the suspension of Eurostar services was posted on signs at the train station. Sophie Potter emails from Brussels: I checked in for the 14.56 Eurostar service from Brussels to London earlier this afternoon and was relaxing in the departures lounge. News of the Channel Tunnel closure broke on the BBC News app before the staff at the Brussels departures terminal even found out. I had told other passengers before the poor lady on the information desk knew anything was wrong. I have to be at London Gatwick airport for 10 tomorrow morning in order to accompany a group of school children on a work experience trip to Montpellier, so I was very worried about getting back to the UK in time. I have been lucky to get a flight to London later this evening but there are hundreds of passengers at Brussels airport trying to find hotel space for tonight. said passengers can exchange tickets free of charge, transfer them for another available service within the next 120 days, or apply for a refund. Kent Police said the fire happened at the French end of the tunnel and that no-one was hurt in the incident. However, large queues have developed at St Pancras International - the Eurostar terminal in London - and queues of lorries have formed at Folkestone, following the closure of the M20, which serves the Eurotunnel. To recap on the situation, passengers are facing severe disruption after the Channel Tunnel was closed "until further notice" following a fire on a lorry inside the tunnel earlier. Eurostar has said all its services for Saturday have been cancelled and trains have have returned to their stations. BBC correspondent Daniel Boettcher said it was "calming down" at London's St Pancras International but there are still "hundreds of people inside the station" trying to get information. tweets: The channel tunnel consists of 2 separate bores. Why are Eurostar not operating trains single-line through the one without the fire? Passengers have been trying to get travel information at St Pancras International, after Eurostar said 26 trains had been cancelled. Stephen Hicks, a passenger stranded in Lille, northern France, said he was one of a group of 12 people travelling back to the UK. He told the BBC: "Our train was stopped at Lille and there was confusion over what was happening. "We are now on a train going through Lille towards Paris. We are going to be in Paris for the night but we have no idea where we'll be staying." Delayed passengers have been offered a refund for their tickets. This was the scene at St Pancras in London earlier. Stuart Mcallister emails: I was waiting to get on the 2.45 Eurostar to London when they announced that there had been a fire in the tunnel. Eurostar have put me up in a hotel for the night. The staff at Brussels Midi were great. Really trying to help people and keeping them informed. Just hope I can get home tomorrow morning. The BBC's south east reporter Peter Whittlesea took this picture of motorists queuing on the approach road to the Channel Tunnel. He said he had been told that some traffic was being diverted to the Port of Dover. Eurotunnel freight trains are stationary at Folkestone, Kent. Charlotte Longstaff emails: I was on the 12:25 train! We were told it would maybe run at 7pm! We are currently in London trying to find a hotel! Was supposed to be going to Paris for a weekend away! Looks like Paris will be booked for another weekend! Very disappointed and scared. Colin Cooper travelling from Moutiers in France to Reading emails: We've been on the train for about seven hours and have been waiting at Lille for quite a while. Now we've been told we're heading for Paris which is about an hour away. It's the ski train and we're just going home after a week's skiing holiday. We're a bit frustrated but there's not very much we can do about it if there's been a fire. You can either get angry or just sit and wait. I'm not sure why they're taking us back to Paris though as we could have travelled from Lille to get the ferry. We've been told Eurostar will arrange a hotel for us - so I suppose we'll get a night in Paris. Passengers in France also face delays and have been forced to make alternative arrangements at the Gare du Nord train station in Paris. a history of the Channel Tunnel in numbers. BBC correspondent Daniel Boettcher said he had seen a piece of paper which was being handed out to disrupted passengers at St Pancras, London. He said: "It offers an apology. It says that if passengers have booked for cancelled or delayed trains they can either get a ticket refund, or a free exchange." Lorries have been halted and are now parked at Folkestone, in Kent, following the closure. Ben Lawton, who was on a freight train inside the tunnel when the fire broke out, has told the BBC News Channel how his train "filled with smoke" before masks dropped from overhead and passengers were then evacuated. The Highways Agency has said junction 11A on the M20, which serves the Eurotunnel, has also been shut. It said passengers are "advised to expect delays due to an unplanned incident which has closed the tunnels for customers heading from the UK to France". BBC correspondent Daniel Boettcher, who is at St Pancras International in London, said: "At the moment many people here don't know where they are going to be staying tonight or when they are going to be leaving on their journey." The passenger queues at St Pancras, London, have now spilled out onto the streets. The Eurostar press office says that since 11:00 GMT 26 trains have been cancelled. Nick Donohoe emails: I work in France and can only get back once a year to see my family and friends. A horrible experience and no information was supplied at the Paris end other than "smoke had caused suspension of all trains this afternoon". No information on what to do about refunds, compensation or even water and food. Horrible experience. Mike Curtis-Rouse emails: Returning from skiing in Tignes on 0945 Eurostar with friends, situation desperate, running out of olives, mini dips and champagne, Humour remains broadly extant. BBC south east reporter Peter Whittlesea said: "From the North Downs above the Eurotunnel terminal, stationary freight locomotives can be seen in a line. There is very little activity. However, lorries are being moved in the terminal. Early reports suggest the tunnel will be closed all day. "But Eurotunnel has in the past operated shuttle service in one tunnel while the other has remained closed. That decision could be made in the coming days if the tunnel itself has been damaged." Charlotte Abrahams has emailed: We are currently stuck on the French side at Lille! We are all fine, we have wine! Mr Lawton, who was on the train to Paris as part of a journey to Poland, said: "We are now in what seems to be a makeshift medical centre in Calais." "We were evacuated off the train inside the tunnel and given gas masks. "Then we were taken to an airtight concrete room within the tunnel and had to wait for two hours. "We were then taken by coach to Calais. We still don't know what's happening." Ben Lawton, in Calais, told the BBC how he was evacuated from his train inside the Channel Tunnel and was then given a gas mask because of the fumes. For passengers facing disruption, Eurostar's customer care number is 03432 186 186, or +44 1233 617 575 for people outside the UK. The Independent's travel editor, Simon Calder, said it was going to be messy and difficult for people trying to make alternative travel arrangements. He added: "There aren't that many flights between London and Paris and Brussels on a Saturday afternoon or a Sunday morning. People will be trying to re-book for tomorrow. "Motorists who were going on the tunnel from Calais to Folkestone will, of course, be able to just switch to one of the ferries which are operating. I understand that they do still have room." He added: "We were stuck outside the Channel Tunnel for about one hour with no information at all, other than smoke had been detected and then we were told we would have to turn back to London. "An hour later we're currently somewhere near Ebbsfleet with no more information other that what I have seen and read online." John Hope was on a train to Paris to celebrate his girlfriend's birthday. "We've had such a terrible experience this morning on the Eurostar to Paris," he told the BBC. Mr Chatterton said crowds at St Pancras were "pretty calm" and said he had been told the tunnel was closed "indefinitely". Kent Police said passengers should "expect significant delays whilst the vehicle is being recovered and fumes are cleared from the tunnels". John Chatterton, who was travelling from London to Paris when his train was turned back, told the BBC the queue at St Pancras station was already 300 or 400 deep. "I was on a train travelling from London to Paris for work. "The train got stopped at Ashford and then we were told that we would be sent back to St Pancras. "We've been told the tunnel will be closed all day and that there won't be any more trains today. "We've been told we have to try and book again, possibly for tomorrow." Queues have already formed at London's St Pancras station - a Eurostar terminal. Tunnel operator Eurotunnel said in a statement that a CO2 alarm went off just before midday on Saturday. says: "Passenger and Freight services are currently suspended in both directions. We are awaiting further info from our teams in the Tunnel." statement advised people planning to travel today to "postpone your journey and not to come to the station". He said: "The investigation into the two alarms is going on at the moment so as soon we know more we'll let [everyone] know." Eurotunnel spokesman John O'Keefe said inspectors were sent into the tunnel after two smoke alarms had been triggered - thought to be around midday. There were no reported injuries and the lorry is being recovered, a Kent Police spokesman said. The fire happened at the French end of the tunnel and is being dealt with by the French authorities, Kent Police have said. Eurostar says all its services today have been cancelled and trains are returning to their original stations. The Channel Tunnel has been closed "until further notice" after a fire on a lorry. Welcome to BBC coverage of news that the Channel Tunnel has been closed "until further notice" after a fire on a lorry. All services today have been cancelled and passengers are being told to expect "significant delays".